Serena will take on her older sister Venus on the opening day of the Mubadal World Tennis Championship. Serena Williams will return to Abu Dhabi, competing in the 11th edition of the Mubadala World Tennis Championship (MWTC), taking place between 27-29 December 2018. Serena will face older sister, Venus, on the opening day of the tournament. Last year, the 37-year-old US-American made her return to competitive tennis after nearly a year away from the game. Less than four months after giving birth to her first child she faced Jelena Ostapenko at Zayed Sports City. The global tennis season will once again kick off in in the capital of the United Arab Emirates as six of the world’s best male players and two of the world’s best female players compete for the US $250,000 prize. Men’s side sees World number one Novak Djokovic, World number two Rafael Nadal, defending MWTC champ, Kevin Anderson, French Open finalist, Dominic Thiem, Australian Open semi-finalist Hyeon Chung and recent Paris Masters Champion, Karen Khachanov. 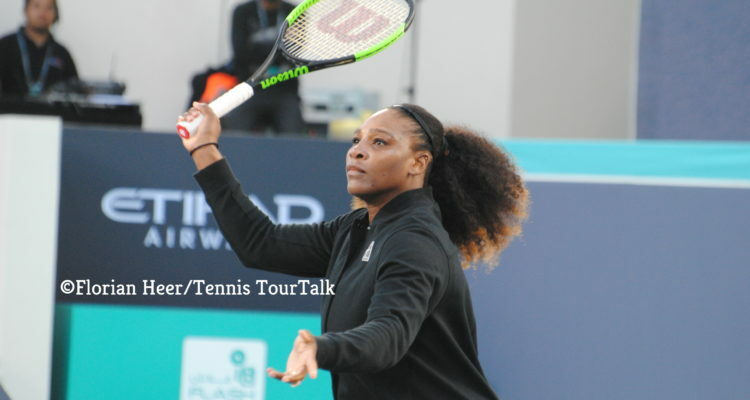 This entry was posted in Mubadala World Tennis Championships Abu Dhabi and tagged Abu Dhabi, Mubadala World Tennis Championship, Serena Williams.